Propagation media with optimal physical and chemical properties are extremely important for uniform rooting and production of quality young plants. A quality loose-fill media has great advantages because it maintains the original structure of the peat and coco fibers to provide optimal air / water porosity for uniform rooting with strong fibrous root system. However, the media can settle and become compacted over time resulting in inconsistent rooting. Furthermore, if the cuttings are not fully rooted, extraction from the trays will be difficult and the transplanting process cannot be automated. The traditional bonded media has advantages that generally a loose fill media is lacking. 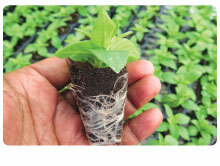 Primarily, the traditional bonded media does not become compact during the course of propagation and is more suitable for automated transplanting. However, the natural structure of the peat and coco fibers are compromised due to the vigorous mixing with the binder. OASIS® Grower Solutions is launching a brand new bonded media technology called Terra Plug. This breakthrough technology allows us to package only the positives of a loose fill media and traditional bonded media, while dejecting their drawbacks. The Terra Plug technology allows the trays to be filled loose and then stabilizes the media using an innovative bonding technology. Terra Plugs are made out of peat and coco fibers. The plugs have a dibble hole for easy insertion of the cuttings. The Terra Plugs have a moisture content of approximately 70% along with an initial starter fertilizer charge. The following fact sheet demonstrates the cutting’s rooting performance and growth when propagated in OASIS® Grower Solutions Terra Plugs. This fact sheet also highlights the other advantages of the Terra Plugs. Petunia ‘Sun Spun Burgundy’ and Geranium ‘Fantasia Dark Red’ cuttings were received in Kent, OH, from offshore locations on 5/27/2015. Cuttings were inserted into OASIS® Grower Solutions Terra Plugs on the same day. The cuttings from both crops were propagated under an intermittent misting regime. For the first 24 hours, the mist system was turned on for 8 seconds, every 8 minutes. After the first 24 hours, the misters ran between 6 am and 8 pm. After the first week following insertion, the misting frequency was further reduced. After the second week, the mist system was totally shut down and the cuttings were watered as required with a hose and breaker using a complete nutrient solution with 100 ppm N.
The day time venting and heating set points in the greenhouse were 75° F and 65° F. The night time venting and heating set points were 70° F and 60° F. The bottom heating on the propagation bench was set at 80° F. The propagation was conducted under a diffused light environment and the greenhouse was shaded when the PPFD was higher than 350 μmoles. m-2. Sec-1. Rooting evaluation was conducted 15 days after sticking the petunia cuttings and 18 days after sticking the geraniums. A 0 to 5 scale was used for evaluating the rooting performance: 0 – Poor Rooting, 3 – Medium or Acceptable, and 5 – Best Rooting. Petunia ‘Sun Spun Burgandy,’ 15 days after inserting. The rooting was 100% and very consistent, shoot growth was very uniform, and liner extraction was seamless.